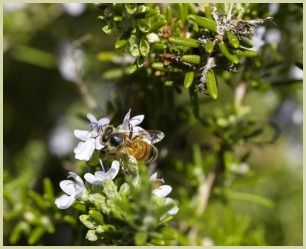 Rosemary plants (rosemarinus officinalis) were originally native to the sunny shores of the Mediterranean, but over the centuries it has been grown and cultivated around the world and today is one of the most popular herbs used in kitchens and cooking. A perennial member of the mint family, the plant resembles a small woody evergreen tree. In fact it's often referred to as a rosemary tree. It's not only attractive, but has many uses, from culinary to medicinal to ceremonial. The pine-like leaves, dried and fresh, are often used in French and Mediterranean cuisine, to flavour meats, potatoes and herb blends. Its name is derived from the Latin phrase for “dew of the sea”. This name came about because the plants are so hardy and need only mist and humidity to survive in rugged conditions. And from this name grew the legend that rosemary was draped around the Greek goddess Aphrodite, when she emerged from the sea. It became an important part of the funeral ritual, with grieving family placing sprigs of rosemary into graves in tribute. It’s even mentioned as a symbol of grief and remembrance in Shakespeare’s Hamlet . It was also part of wedding ceremonies: brides would wear a sprig in their hair or carry it in their bouquet and newly weds would plant some on their wedding day, as a symbol of the growth of their relationship. ...Ongoing studies are looking at whether it can aid in lowering the risk of stroke, ALS and Alzheimer’s disease! Other active components have also proven to be strong anti-inflammatories, which help relieve pain, digestive problems and rheumatism. Click here to read about the health benefits. ...It needs soil that has great drainage, and 6-8 hours of sun per day. It does not tolerate over-watering, and can be vulnerable to frost. But apart from those conditions, it's easy to grow and suitable for the beginner gardener. See tips and advice on growing it. In the garden it will thrive in a small pot on a sunny patio or windowsill or straight in the herb garden. So why not have a couple of rosemary plants growing in your garden or kitchen for a continual supply of tasty leaves on hand all year round? You can even use them to make a healthy cup of rosemary tea! Basil - All You Need to Know About the "King of Herbs"